If you thought you had tough moral decisions to make in games like Skyrim, think again. Not only will this game change its ending depending on your choices, but it will make you take a look at yourself and answer some personal questions. Catherine! The puzzle solving nightmare of a young man in trouble. Can you help him steer back into what is right, or will you push him to continue the wrong path? Catherine lasts about seven days for our hero. A curse is affecting your city, and has just landed on you, but you don’t know it. This curse is killing unfaithful men all around and you might be no exception. After a late night at the bar with your friends, you get seduced by a beautiful young lady. Everything would be great, except you have a girlfriend and are now in the claws of this nightmare of a curse. And it is an actual nightmare, with the exception that if you die, you die in real life. You better not screw up. After your “accident”, the story will progress as the main character tries to figure out what his next move will be. Will he tell his girlfriend what has happened? Will she find out? It is quite suspenseful and your choices will affect the final outcome. There two main location for the story. A bar where you speak with your friends and get advice while trying to figure all of this out, and your nightmares where you try to survive. Your friends will mostly talk about how screwed you are, and how many problems they have too. It is great if you want to know about these people, and you will, but if you don’t like talking with people, you will miss out on a lot of the story. Likewise, there are other people around the bar that will tell you stories and reveal great insight into the curse and game. But if you don’t talk to them, you will miss out on some interesting information. Through the story the nightmare will change, move around, and sometimes disappear. Inside the nightmare its another story. Inside your nightmare, you will meet with others who have suffered the same fate as you. They will provided you with helpful hints and tell you about their stories, more or less. Most of the time, they are just concerned for their own safety, so selfish. Bluh! Anyway, its during your nightmares that you will be confronted with the soul searching questions of the game. Each time you clear a level inside the nightmare you will meet with “someone” and they will ask you one question before letting you onto a higher level. This question will sometimes be easy to answer, like “Do you prefer light rooms with loud noises or dark room in silence?”. But sometimes they will make you ponder about yourself and what you believe in. I found these moments to be the best moments of the game because they asked me things that I could relate to as suppose to “Would you like to kill this alien and then buy a planet?”, can anyone but someone like Chuck Norris really relate to that? Either way, the questions were something that I awaited eagerly. Oh and after you answer you will see what other people have answered in a graph, it gives you a nice look at society. The nightmare part of the game, is the most action and puzzle solving part of it. The curse makes you have these dreams about a tower that you must climb and ring the bell. If you fail, if you die, you die in real life. If you get to the last level, legend has it that you will be free. For you to do that you will have to climb your way through many puzzles. Each night has about three puzzles that you must complete, the last one being the boss battle. As I have said, puzzle are basically towers that you must climb. These towers are made of blocks that can be pushed and pulled in every direction. They are puzzles because you will need to pull and push them around if you want to climb. Pushing the wrong block can kill you, or lower the tower making it impossible for you to reach the top. Which will make you start over. By now you must be saying “But dude, that is like so freaking easy! I mean you just climb!”. Hahahah, you poor souls, of course it is not hat easy. There is a timer, and traps, and special items, and it is usually not just as straight forward as just going up. But don’t worry, none of them are impossible and you will eventually over come all of them, or I hope so. The boss battles are pretty much the same… EXCEPT FOR A GIANT MONSTER AT THE BOTTOM TRYING TO KILL YOU! Also it has special attacks, so you know, be careful. Aside from the crazy rush and moral questions during the nightmare stages, there is also the theme of the place. Each night has a different theme, which are sometimes creepy but most of the time really great to look at. Not that you will look at it much since you will be running away. Aside from all this the look of the game is pretty nice. The cinematic are always welcome and because the story is nice and short at no point do you feel like it is going to slowly. The cinematic are either 2D or 3D. Both look good but I wish they had settle for one or the other. As for the different outcomes, depending on whether you were a bad person or a good person, you will get different endings. But don’t think that there are only two of them. There are about 8 different ones and they are all pretty great, so you might want to play it more than once. The only thing left to mention is that you may play with friends. But it is only a competitive puzzle climbing and you don’t miss anything if you don’t play it. 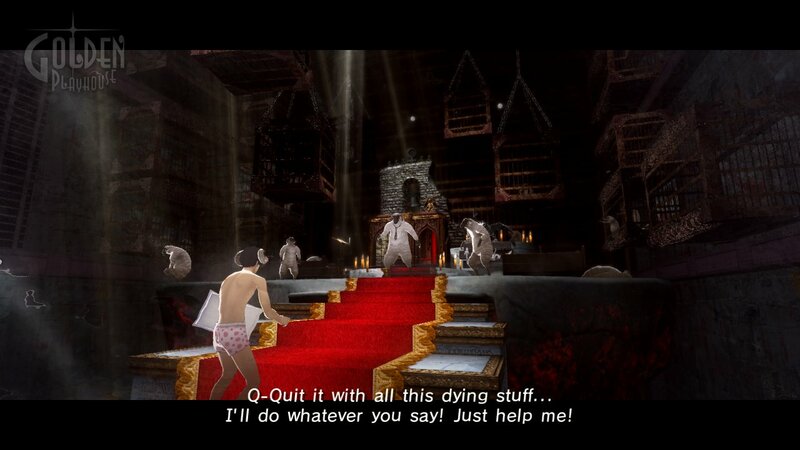 Catherine is a great game that most people should play. It is fun, it has drama, and it makes you think about yourself. But it is not an action game, so when I say that every one should play, I think I am saying too much. If you are under 18, stay clear of it for a bit, and if you are too old, well play it but it might just seem stupid to you. I would say between 18-35 it should be a great game. But don’t just go on my word, play and see for yourself. So, just play it, it might creep you out, you might love it, only you can tell. This entry was posted in Reviews and tagged bar, catherine, creepy, death, girlfriend, nightmare, ps3, puzzle. Bookmark the permalink.